Official factory photographs of 356-C Coupe & Cabriolet. 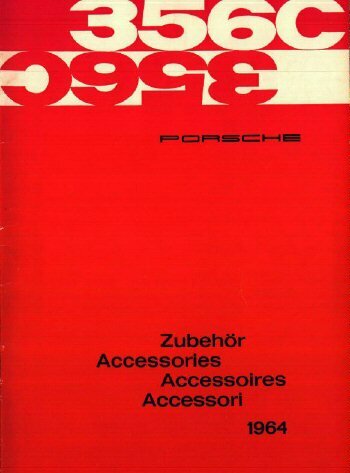 Below is a listing of Porsche 356-C factory accessories as shown in an accessory brochure dated September 1964. All the standard items are included, and there are some others rarely seen. Unfortunately, not all items listed below had photos in the booklet, but most that were included are shown. At the end of each discription is the listed price per the factory price list (shown above). The major 356-C factory sales brochures! Extended Steering column 1 3/16" for Left Hand Drive Cars. "Golde" Electrically operated Sun Roof for Detatchable Hard Top. Electrically heated winshield for Coupe. 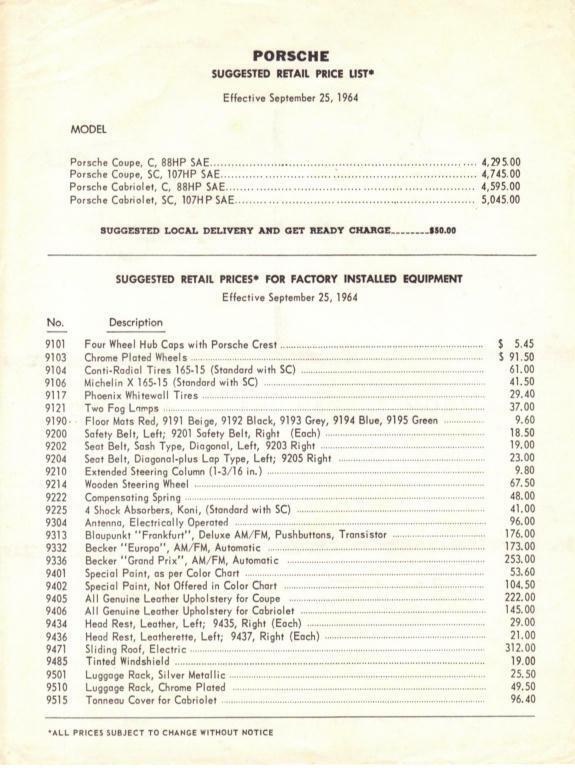 New: 356-C Accessories Price List for Model Year 1965. Scroll down to the bottom of this website! 1. 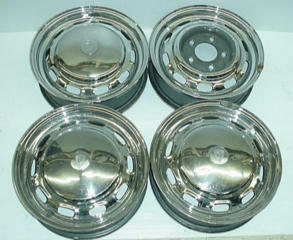 9103 Chrome-plated wheels, 5 pieces ($68.75). Tire Options from the Factory! 2. 9104 Conti radial tires 165-15 ($43.90). 3. 9105 Dunlop SP tires 165-15 ($43.90). 4. 9106 Michelin X tires 165-15 ($29.00). 5. 9107 Phoenix tires 165-15 ($43.90). 7. 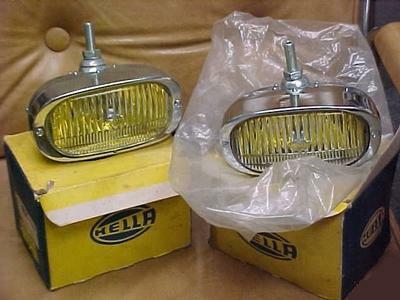 9121 2 fog lamps yellow reflectors ($27.25). for the Installation of fog lights. 9122 Headlight grills, removable ($22.00). 8. 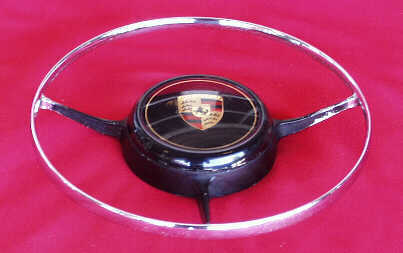 9125 Outside rear-view mirror, left ($3.40). 9. 9126 Outside rear-view mirror, right ($3.40). 10. 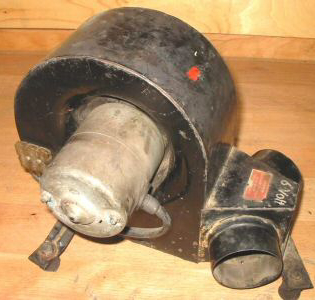 9131 Outside rear-view mirror, Talbot, left ($5.65). 11. 9132 Outside rear-view mirror, Talbot, right ($5.65). 12. 9167 Outside/Inside thermometer ($15.00). 13 .9168 Outside/inside thermometer, next to clock on instrument panel ($15.00). 14. 9173 Sun visor, left with vanity mirror ($1.35). 15. 9180 Handlamp, electric ($2.75). 16. 9185 Electrically operated windscreen washer ($14.15). Floor mats and Coco mats! 17. 9190 Floor mats coco-red ($7.50). 18. 9191 Floor mats coco-beige ($7.50). 19. 9192 Floor mats coco-black ($7.50). 20. 9193 Floor mats coco-grey ($7.50). 21. 9194 Floor mats coco-blue ($7.50). 22. 9195 Floor mats coco-green ($7.50). 23. 9196 Floor mats "Veluran", 3 pieces ($23.75). 24. 9200 Safety belt for one seat, left ($13.50). 25. 9201 Safety belt for one seat, right ($13.50). 26. 9202 Safety belt, diagonal, sash type, left ($14.00). 27. 9203 Safety belt, diagonal, sash type, right ($14.00). 28. 9204 Safety belt, diagonal-plus lap type, left ($17.00). 29. 9205 Safety belt, diagonal-plus lap type, right ($17.00). 30. 9210 Extended steering column (1 3/16 in.) for left-hand drive ($7.25). 31. 9212 Horn ring, chromed ($5.25). 32. 9214 Wooden steering wheel ($51.25). 33. 9216 Fire extinguisher ($6.50). 34. 9222 Compensating spring ($28.27). 35. 9225 4 shock absorbers, Koni ($30.25). Click for more detailed information about shocks for 356 Porsches. 36. 9226 Fresh air blower ($62.50). Fresh air blower from B/C Workshop Manual. 37. 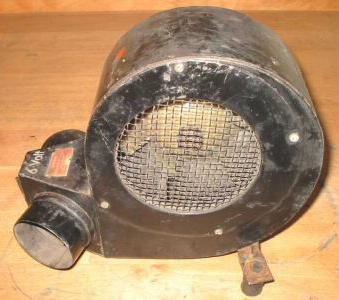 9228 Additional heater BN4 Eberspacher ($199.00). 38. 9231 Traveling kit for engine type 1600-C ($20.00). 39. 9232 Traveling kit for engine type 1600-SC ($26.25). 40. 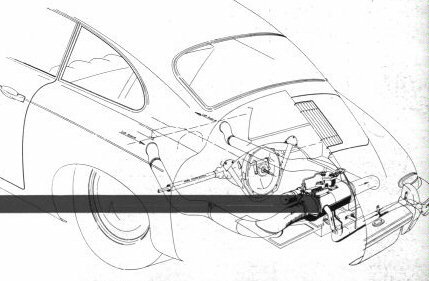 9234 Traveling kit for engine type Carrera GS (No price given!). 41. 9240 3-piece set of leather suitcases w/straps, for luggage space, black ($96.25). 42. 9241 3-piece set of leather suitcases w/straps, for luggage space, brown ($96.25). 43. 9242 2-piece set of leather suitcases w/straps, for luggage space, black ($86.25). 44. 9243 2-piece set of leather suitcases w/straps, for luggage space, brown ($86.25). 45. 9244 2 luggage straps for luggage space, black ($3.75). 46. 9245 2 luggage straps for luggage space, brown ($3.75). 47. 9246 Elastic strap for fastening suitcases in luggage space ($1.25). 48. 9248 Leather suitcase, big, black for under hood ($35.00). 49. 9249 Leather suitcase, big, brown, for under hood ($35.00). 50. 9250 Canvas suitcase, red/black, behind emergency seat ($8.65). 51. 9255 Canvas suitcase, big, red/black, under front hood ($15.15). 52. 9257 Suitcase "Skai-Dur" bronze, under front hood ($23.25). 53. 9258 Canvas suitcase, small, red/black, under front hood ($11.00). 54. 9261 Canvas bag, red/black, under front hood ($8.65). 55. 9264 Suitcase "Skai-Dur, black, under front hood ($23.15). 56. 9301 Antenna, manually operated ($12.15). 57. 9304 Antenna, electrically operated ($68.75). 58. 9306 Antenna lockable ($13.75). 59. 9309 2 loudspeakers ($16.25). Blaupunkt and Becker Radio Options! 60. 9310 Blaupunkt Bremen ATR-M-L (transistor) radio ($92.50). 61. 9311 Blaupunkt Stuttgart ATR AM/long wave/short wave (transistor) radio ($113.75). 62. 9312 Blaupunkt Frankfurt ATR de Luxe UKW (transistor) radio ($141.25). 63. 9313 Blaupunkt Frankfurt ATR de Luxe AM/FM/long wave (transistor) radio ($141.25). 64. 9315 Blaupunkt Koln ATR de Luxe UKW automatic (transistor) radio ($185.00). 65. 9316 Blaupunkt Koln Atr de Luxe AM/FM/long wave automatic (transistor) radio ($185.00). 66. 9330 Becker Monte Carlo AM radio ($98.75). 67. 9331 Becker Europe Am/FM/long wave radio ($138.75). 68. 9332 Becker Europe AM/FM radio ($137.50). 69. 9335 Becker Grand Prix AM/FM/long wave automatic radio ($201.25). 70. 9336 Becker Grand Prix AM/FM/long wave automatic radio (US) ($201.25). Click here for more info on Blaupunkt radios! 71. 9401 Special paint, offered in color chart ($37.50). A few of the standard 356-C colors! 72. 9402 Special paint, not included in color chart ($75.00). 73. 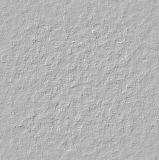 9404 Special paint for detachable top ($15.00). Click here for more info on factory Color Charts! 74. 9405 Complete genuine leather upholstery for Coupe ($156.25). 75. 9406 Complete genuine leather upholstery for Cabriolet ($102.50). 76. 9408 Genuine leather seats for Coupe ($50.00). 77. 9413 Additional bucket seat, genuine leather, left ($77.50). 78. 9414 Additional bucket seat, genuine leather, right ($77.50). 79. 9415 Additional bucket seat, leatherette, left ($52.50). 80. 9416 Additional bucket seat, leatherette, right ($52.50). 81. 9417 Additional bucket seat, leatherette/corduroy insert, left ($52.50). 82. 9418 Additional bucket seat, leatherette/corduroy insert, right ($52.50). 83. 9434 Head rest with fittings, leather, left ($20.00). Original factory head rests did not have Zippers! 84. 9435 Head rest with fittings, leather, right ($20.00). 85. 9436 Head rest with fittings, leatherette, left ($14.75). 86. 9437 Head rest with fittings, leatherette, right ($14.75). 87. 9438 Head rest with fittings, corduroy, left ($14.75). 88.9439 Head rest with fittings, corduroy, right ($14.75). 89. 9440 Fittings for one headrest, left ($3.15). 90. 9441 Fittings for one headrest, right ($3.15). Removable Hardtops, Convertible Tops, & Sun Roofs! 91. 9450 Additional soft top for Cabriolet, black ($237.50). 92. 9451 Additional soft top for Cabriolet, grey/beige ($237.50). 93. 9460 Additional detachable steel roof, standard color ($237.50). 94. 9471 Steel sun roof "Golde", electrically operated for Coupe ($220.00). 95. 9472 Wind deflector for steel sun room "Golde" ($21.25). 96. 9475 Steel sun roof "Golde", electrically operated, for detachable steel roof ($232.50). Click for more information on 356 Porsche Removable Hardtops! 98. 9487 Electrically heated windshield for Coupe ($87.50). 99. 9488 Electrically heated windshield for Cabriolet ($87.50). 100. 9490 Chrome strips (on sides) ($9.50). 101. 9495 Horn, roadmaster ($42.50). 102. 9497 Fuel tank, 70 liters ($27.50). Luggage Racks, Straps, & Tonneau Covers! During the period, 1956 through the end of the 356 era in 1965, Porsche offered luggage racks for mounting on the rear deck lid, from two different suppliers, Reutter initially and then Lietz. The Reutter racks appeared in the early 356-A factory accessory booklets, and it was noted that they came in three styles: (1) silver painted, (2) same color-of-the-car painted, and (3) chrome plated. The silver painted version was probably the most popular as chrome plated Reutter racks are few and far between. Lietz racks came chrome plated only. The below factory source indicates that the Lietz racks were first introduced around April of 1960. Some believe that Reutter did not make chrome plated luggage racks. However the below reference seems to indicate otherwise. 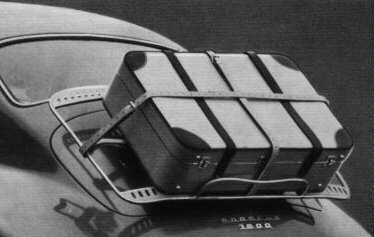 The 356-C factory accessory booklets continued to show the Reutter rack, as item #9501 luggage rack, silver metalic (painted), along with Item #9510 luggage rack, chrome plated, w/8 ski straps, which is the Lietz rack. 103. 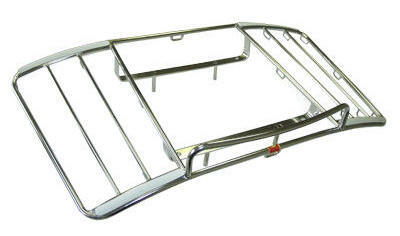 9501 Luggage Rack, Silver Metalic ($21.75). 104. 9503 4 straps for 2 pairs skis on luggage rack ($1.25). 105. 9510 Luggage rack, chrome plated, w/8 ski straps ($34.40). 106. 9511 1 set straps for luggage rack, brown ($4.25). 107. 9512 1 set straps for luggage rack, black ($4.25). 108. 9515 Tonneau cover with zip fastener, canvas ($66.25). 109. 9516 Tonneau cover with zip fastener for detachable top, canvas ($66.25). (different than #9515 because there is no folded convertible top to cover). 110. 9572 Limited slip differential ($85.00). Earlier Prices above may differ from prices in this Model Year 1965 listing! 356-C Accessories Price List for Model Year 1965! Push button: go directly to DerWhite's 356 Literature Website!